not too impressed as I am rarely sick. On Saturday I went down to Sydney to visit my daughter, Natalie, she is due to have her first baby in 6 weeks time. It wasn’t until on the morning I hopped on the net to check the rail timetable that I found out that there would be trackwork, so I was going to have to catch a rail bus to Sydney from my local railway station. It had been years since I last caught a bus, as I, like most people am always running to and fro by car. So it was lovely to ‘rock up’ to the station, purchase a train ticket and wander over to the other side of the station to hail the rail bus which had journeyed down from Newcastle. I was able to get a seat behind the bus driver. I put on the seat belt and away we went. 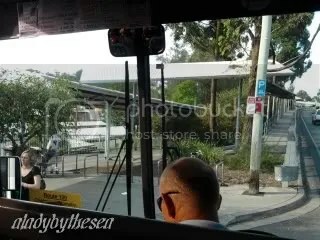 By the time we got to Gosford the bus was full and we ‘hopped’ up to the F3 freeway. I don’t know how many times I have driven down the freeway to Sydney but driving at 110kmph my whole focus had been on the traffic around me. Now I could sit back and watch the world go by especially as we crossed the Mooney Mooney bridge which is perched above the Mooney Mooney river 75 metres below. Yikes. I arrived in Hornsby to be met by my daughter and after cruising the shops and having some morning tea we headed off to her house to preview all the things she had been given so far by friends/family. Lots of things – a cot, prams, clothes, nappies, cuddle rugs galore. Natalie will be having her baby shower next Sunday and will be having about 30 family/friends bearing gifts. While we were shopping we went through a list of what she needed and so far she pretty much has everything, which is making it a bit hard for me to choose what to get her, as I’m not one to buy baby needs until just before baby is due. So in 3 weeks, when she starts maternity leave we will get together again and shop for last minute items.